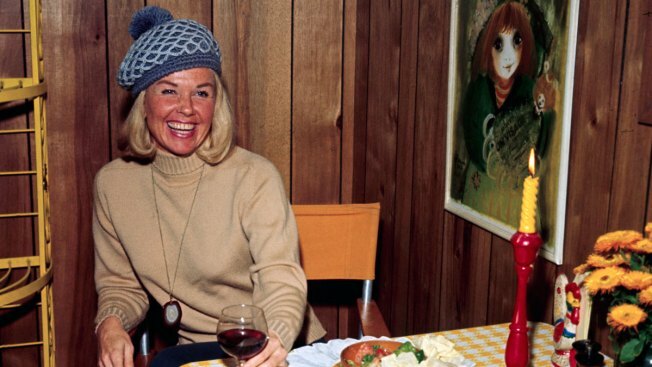 Actress Doris Day having lunch on Feb. 25, 1970 in Hollywood, California. To Doris Day's many admirers, the pert and fresh-faced charmer who starred in "Pillow Talk" and "Move Over Darling" is ageless. But Day turns 95 on Monday — which is a birthday surprise to even the star herself, who has long pegged her age to a 1924 birthdate that would make her 93. Media outlets have variously reported her as between 93 and 95. A copy of Day's birth certificate, obtained by The Associated Press from Ohio's Office of Vital Statistics, settles the issue: Doris Mary Kappelhoff, her pre-fame name, was born on April 3, 1922, making her 95. Her parents were Alma and William Kappelhoff of Cincinnati. "I've always said that age is just a number and I have never paid much attention to birthdays, but it's great to finally know how old I really am!" Day said in a statement Sunday. She's in excellent company with other vibrant Hollywood standouts lucky enough to reach that milestone year, including Betty White, a close friend, and Carl Reiner. "There has long been speculation and rumors about Doris' age and we get this question a lot, looks like we finally have the answer," said Day's spokesman, Charley Cullen Walters. "The story I have heard the most is that at one point Doris was up for a role when quite young and her age may have been miswritten on the audition form. We don't know if that's correct, but if so it could've simply stuck for all these years." He said Day and White had long joked about White being two years older. "Now we know that they are actually just a couple months apart, and turns out it's an even bigger exciting landmark than we thought," Walters said. White was born in January 1922. On previous birthdays, Day has said she doesn't care about her age but rather using the occasion to highlight her favorite cause: animals. A longtime supporter of animal welfare, Day founded the nonprofit Doris Day Animal Foundation in 1978 to provide grants to projects that rescue, care for and protect animals. Among the wide-ranging recipients: a group that helps seniors and others with pet care needs; one that provides trained service dogs for veterans and others; Iowa Parrot Rescue, and Misfit Acres, a Minnesota horse sanctuary. Day, who lives in Carmel, California, has effectively parlayed her fame for her mission. This year, she's seeking to bring younger people on board with a social media campaign that asks people to post a photo or video of their pet with the hashtag #DorisBirthdayWish and the tag @ddaf_org for her foundation. The best of the submissions will be combined into a digital birthday card for her. Famous friends and admirers are among those saluting Day online. Country music star Reba McEntire tweeted that she was donating to the foundation and invited her Twitter followers to do the same. Day, who started out as a big band singer, made her film debut in 1948 with "Romance On the High Seas" before starring in a string of smash-hit 1950s and '60s rom-coms. She remained a pop star as well, with hits including "Whatever Will Be Will Be (Que Sera)" and "Secret Love." "Pillow Talk" earned her an Academy Award nomination, and she won critical acclaim for dramatic turns in "Midnight Lace" and "Love Me or Leave Me." But Oscar gold, including the lifetime achievement award that her career justifies, hasn't come to her. Yet Day, who once dismissed her "goody two shoes" image as "so boring," isn't necessarily predictable: Walters said she has been offered the honorary award several times and politely declined. She always concludes, he said, in a "classic Doris tone — 'Never say never!'"